I was reflecting on the dissatisfaction I am experiencing with the state of Filipino martial arts tournaments. There is no secret that I would like to see empty handed fighting divisions in FMA tournament. But I think our Eskrima tournaments can use an overhaul in the way the stick is applied in the sparring division (not to mention a complete BAN on Eskrima “kata”… I just don’t like them!) because one thing I do agree with many of our Eskrima brothers is that our tournaments simply aren’t “real enough” (are any tournaments short of death matches really real enough?). There are a few ways we can modify how our tournaments are arranged. First, I believe that the weapons we simulate in tournaments should be judged and ruled as whatever those weapons are supposed to be. So in that case, I believe that a hit to the body should count for only 1/4 of a hit to the head or a hit to the forearm or hand. In Eskrima tournaments, we simply don’t award enough for hits to the hand, whereas the hand and forearm are perhaps some of the best targets for stickfighters and knife fighters alike. A hit to the head is something that shouldn’t be necessary to hit 25 – 50 times in order to win a match; three times should count as “game” to an automatic win. Secondly, if there were bladed divisions, such as Bolo or thrusting sword divisions, we should use the Japanese style of “Ippon Kumite”, meaning that an unanswered, killing blow that is recognized by all judges would automatically count as a win. That would alleviate all the back and forth confusion/trading that modern Eskrima is known for. To be honest, when I competed in the Philippines, we always knew who was winning. When I watch the tournaments today, it is very difficult to score. I actually prefer the point system used by some of the Stockton Eskrima clubs to score their matches. However, I do miss the combination-style hitting that I train to use. Lastly, focus should be on the landing of strong, clean blows that–in real combat–would incapacitate the opponent. If we did this, we could actually have challenging matches with not just our Eskrima sticks, but allow the use of other weapons, such as the spear, the staff, the knife, and even the Bayonet. (Yes, the Bayonet. 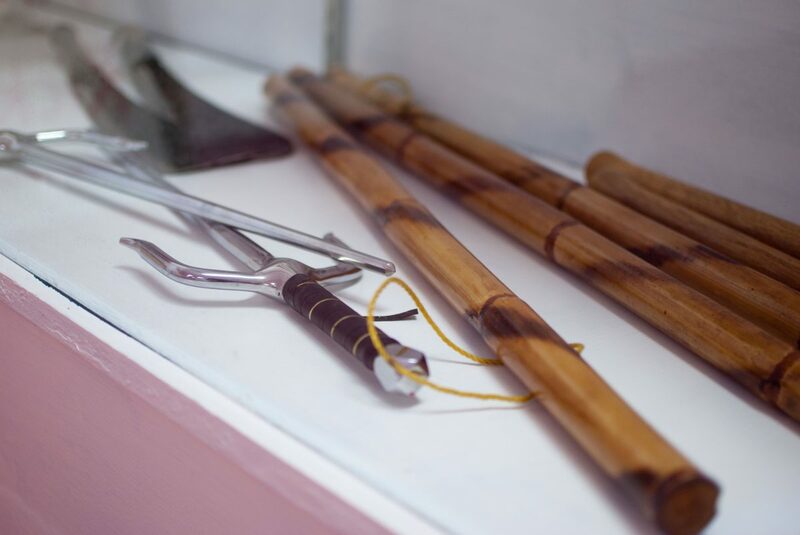 Maybe some of you from the province forget that our old men taught this weapon as part of the Eskrima we studied. Some of us are actually embarassed by this weapon, as if the Bayonet made our systems look “country” and unsophisticated. Check out Big Stick Combat’s article on this weapon) Doing this will really raise the esteem and respect of our native arts in the minds of spectators and participants alike. My inspiration: I read Darrin Cook’s article a few days ago on the bayonet, and thought about a Japanese weapon that is very similar to the Bayonet art I learned as a teenager, the Naginata. When I was a young man, I had the chance to spar with a young lady who had learned this weapon as a girl, and found that the techniques she taught me (after whipping me good) were identical to the Bayonet techniques I learned as a boy. When I searched youtube for something similar, I came across this clip (below) of a Naginata competition, and I realized that this is how I’d like to see the Filipino Martial Arts showcased–in a way that highlights its strengths and allows it to keep its dignity as a fighting art despite being a competition/spectator sport. Please check it out and see if you agree with me. Thanks for visiting my blog! I couldn’t agree more. Continuous sparring in FMA’s looks a mess. I’ve tried to explain how it’s scored/judged and I think I confused myself trying to explain! LOL More structured rules with more/less points given for certain technique’s and/or combo’s, may help in this area. I would even suggest make the body armor, gloves “less” padded so when hit you would feel it, and players be more apt to protect yourself rather than trade a hit for a hit. Use defense and counter or offense to counter, but don’t get hit. The Naginata looks nice, but might get more from it if I knew what was legal/illegal, and how points were scored. i like the flags method of calling points, but they don’t stop the action. and your right about less padding, because it makes it hard to just ignore a hit and keep going. this part is way to non-realistic. I’m in favor of keeping the kata (anyo or sayaw) because I believe it’s traditional, and part of the art. And that’s the key –I don’t think spectators at the tournament are seeing art, or skill. i would say use minimal padding; ie head, gloves knee and maybe elbow and thats it. no wekaf samurai suits of padding. That way there would be more skill then the caveman like swinging of sticks, spectators see with wekaf, due to excess padding and there fore minimal respect for the stick and the potential for damage that it can do. By forcing competitors to feel the impact more would cause them to show more technique and finesse as well as accuracy. you would see more strategy and foot work rather than seeing two people wildly swinging. to be honest at most escrima continuous tournaments your average spectator could not tell the difference between “experts” “sparring” and taking two people with no training and telling them to hit the eachother as many times as possible until times up. sadly they would look the same. two ppl running head on at eachother swinging wildly. we need to definately change how these tournaments are run. What I’ve heard from alot of other guys, and after the last tournament I fought in I happen to agree with them, is that the problem doesnt necessarily lie in the rules/format but in the judges/centers/refs. Alot of times its hard to get judges, and sometimes guys with little experience (fighting) are put in. Sometimes the judges have limited exposure to other styles, and can’t tell what is really happening in the match. Ive seen countless hand hits not called by judges, simply because they are in a style that doesnt practice that style of targetting/hitting. Or judges that will null a strike, if a blocking motion is made, even when the strike still lands (which will wreak havoc on your score if you are style that likes to draw blocks and wrap your counter around the block). And sometimes its simply just the angle from which the judges are sitting, that prevents them from seeing the actual events. A good center/ref also goes a long way into keeping the pacing more realistic. Even wekaf rules require a show of defense and fighting skill, but without a good ref to break overly mutually killed exchanges (e.g. both fighters simply wailing away at each other), no matter what the rules say it will continue to happen. I know for myself it is hard to let a hit go un-answered, to keep to the spirit of a rule, when the other guy isnt paying attention to it, and the ref isnt breaking us up. Though, ultimately going back to the days of no armor and live sticks, or closer to those days as we can get, may be the only way around the un-realism of matters. yes i agree federico. it is also one of the problems of having teachers with no experience teaching and judging, but they want to lead others. the martial arts is the only place where a man with no fighting experience is seen as a “fighter”. judges and teachers really should been competitors in the past.